Located barely more than an hour's drive from San Antonio, Choke Canyon Reservoir is among Texas' best big bass lakes and perhaps the biggest bass fishing secret in the country. Since it is surrounded by state parkland, Choke Canyon is devoid of any shoreside development. This lack of development has certainly aided in Choke's relative anonymity. It has also prevented the lake from playing host to nationally televised bass tournaments - which are often responsible for spreading the word about hot bass lakes. So, despite producing an incredible amount of 5 to 10-pound bass in recent years, Choke Canyon sees relatively little fishing pressure. However, don't let the lack of "buzz" fool you. Over the years, 26,000-acre Choke Canyon Reservoir has produced plenty of notable bass catches. Numerous small circuit tournament records have been set there. The current lake record largemouth stands at an impressive 14.66 pounds. However, the lake has managed to stay relatively obscure on the national scene. Again, much of Choke Canyon's anonymity has to do with its location. Situated approximately 75 miles from San Antonio, Choke Canyon is largely 'in the middle of nowhere.' The tiny towns of Three Rivers and George West are the only close by 'population centers.' But, for fishermen in search of a career-best bass, the drive to 'nowhere' is well worth it. The other major reason for Choke's lack of notoriety - the fact it is surrounded by public land - is also a major bonus to anglers. Texas Parks & Wildlife maintains Choke Canyon State Park as two separate 'units' - the Calliham Unit lies in McMullen County, while the South Shore Unit is in Live Oak County. At 1,100 acres, the Calliham Unit is the larger of the two. The Calliham Unit is fitted with screened shelters and a variety of campsites for those wanting to stay on the lake itself. It also has 2 miles of hiking trails, a mile-long birding trail, a wildlife educational center, four boat ramps and a man-made 75-acre lake. In short, the Calliham Unit offers everything needed for an all-around outdoor experience. Though the South Shore Unit contains only 385 acres, it is still an excellent shoreside spot for a variety of activities. This unit is a 'day-use' only facility, meaning no overnight camping is allowed. However, there are plenty of spots within the park that allow for picnicking, birding, hiking and wildlife viewing. The South Shore Unit also houses a 6-lane boat ramp. Although Choke flourished upon its opening, during the decade-long drought that spanned the turn of the century, fishing declined. 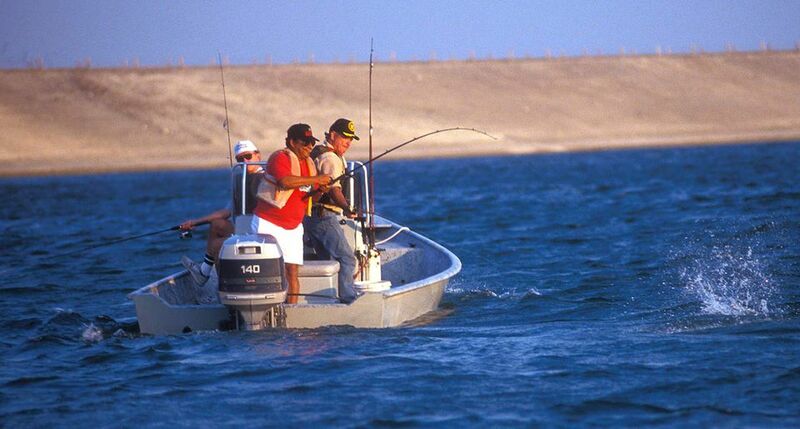 When that drought broke in 2004, fishing rapidly rebounded. Over the past five years, Choke has spit out numerous double-digit bass. Fishermen headed to Choke Canyon can expect to find fish via one of two methods. Through the mild weather months, expect fish to hit surface plugs - notably poppers, buzzbaits and frogs - around hydrilla beds. During the extreme temperature months, look for fish to be hanging around deep structure. This means the outside edges of grass beds during summer and standing timber or old tank dams during winter. When fish are deep, a Texas-rigged lizard, deep diving crankbait or punch jig is the best bet. Though the immediate area around Choke Canyon is sparsely populated, there are still a number of dining and lodging options available to visitors. Among the most popular eateries are Nolan Ryan's Waterfront Steakhouse and Grill, which is out near the lake, as well as the Ranch House and the Staghorn Inn, both of which are located in the town of Three Rivers. Among the newest accommodations in the area is the Choke Canyon Lodge, which is near the lake, just a short drive from Nolan Ryan's restaurant. Right next door to Ryan's restaurant is the Bass Inn. Back in Three Rivers, the Regency Inn is conveniently located right next door to the Staghorn Inn restaurant. The Three Rivers Best Western and the EconoLodge are also good choices for anglers looking for a place to stay.